BP Oil Leak Latest Update, What Went Wrong, What Is BP Doing Now, How Will This Impact the US Economy? U.S. Attorney General Eric Holder is meeting with top federal attorneys in the Gulf region to discuss what legal actions will be taken against BP. John Hofmeister, former CEO of US operations at Shell, shares his insight. He also explains that tens of thousands of people will be laid-off due to Obama's decision to suspend drilling. 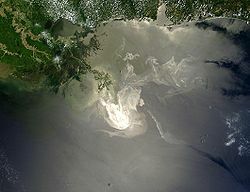 Hear about more of the latest updates on the BP oil leak below.